As inventory data is added to the software license monitoring (SLM) console, you may find that the a manufacturer is represented by multiple versions of its company name. You can create one normalized manufacturer name that is used in place of those variations. You can select those names and group them so that one normalized name is used for all of them. That normalized name is then displayed in the list. The SLM console includes normalized manufacturers. The first time you open the list of manufacturers, you'll notice that the list includes commonly used manufacturer names that have been normalized. Ivanti may provide additional normalized manufacturers. When they become available, they will be downloaded automatically as patch content. If you have already defined normalized manufacturers of your own, your content will be maintained. Any new normalized manufacturers that might conflict with your own definitions will not overwrite your custom content. You can create a normalized manufacturer in the following ways. Find the manufacturer names you want to combine (using the Search box if needed). Select the manufacturer names that you want to include in the normalized name. Select one of the existing names as the normalized manufacturer name. 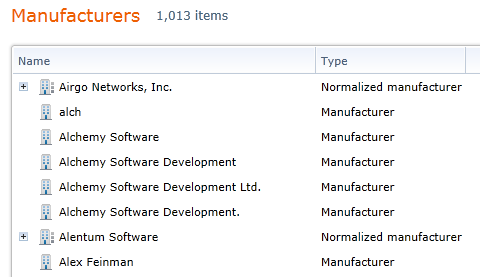 The name you select is added to the normalized manufacturer names in the Administration>Manufacturers page. When you expand the name (click +), you'll see all the names that are grouped for that normalized name. You can create rules that will automatically add manufacturer names to a normalized name. For example, you could specify that any manufacturer name that begins with "Adobe Sys*" is automatically added to the normalized "Adobe Systems Incorporated" name. On the toolbar, click New > Manufacturer. Type a name for the normalized manufacturer. Manufacturer names currently in the database that match the rules are listed in the Matching manufacturers box. As new inventory data is added and other similar manufacturer names are added to the database, those names will automatically be included in the normalized manufacturer name. If you have created a normalized manufacturer and then find another manufacturer name that you want to include with the other names, you can add the name to the normalized name. Select the manufacturer name you want to add to the normalized manufacturer name. Click Actions > Move to normalized manufacturer. 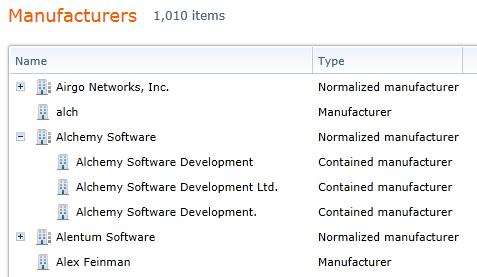 Select a normalized manufacturer and click OK.